Sitting at the very height of the Kawasaki throne sits two kings fit for any road. 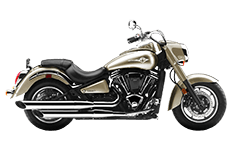 The Vulcan 2000 and VN2000 motorcycles are the pinnacle of the green machine's lineup of cruiser bikes, and riders who know how to tame these beasts know exactly what they want in aftermarket, performance gear. Enter the Viking Bags lineup of luggage. You won't find another set of saddlebags quite like it, and the affordable price makes the long-lasting build quality that much more attractive. But you don't have to take our word for it – just check out the pages for yourself!